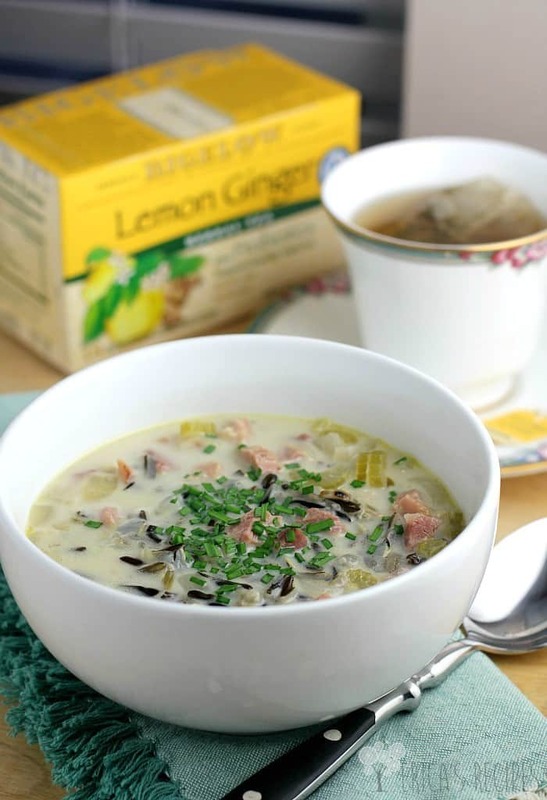 A Soothing Lemon Ginger Ham and Wild Rice Soup to sooth the body and the soul. During the season of sniffles and such, this incredibly good soup with refreshing ginger and lemon, comforting but light none-the-less, is just want you will want when you are under the weather. Oh heyyy Happy New Year! Coming off the little break, I have so much to share too but clearly I can’t do it all at once. So I will start with a bit of smooooth comfort. For winter. …and my plan was to bring you this soup in the midst of debilitating cold and snow and slush and despair. … but it was 86 today. Of course, I live in Florida, so I don’t expect much. But c’mon can we please just get a little chill in the air? I’m carrying around an extra 10-lbs of holiday happiness right now so today it just can’t be bathing suit weather. It just can’t. I need layers. Moving on… One thing these warm Florida falls and winters bring are allergies for my family. And the excessive allergies combined with cold and flu season inevitably lead to pneumonia and bronchitis and other awesome stuff. So as much as I love our weather, there are some pitfalls particularly for my asthatic family. Enter soothing lemon and ginger tea. Paired with a comforting creamy soup. It helps. Boy, does it help. This this soup. This is just so delicious. The inspiration for this little pot of gold was the Bigelow tea, clearly. Ginger and lemon. Hmmm. Really truly. And can I be honest? I am not a soup fan. …I just don’t think – “oh, I’d like a bowl of liquid for dinner”. That never happens. But I saw the lemon ginger tea, and my family really suffers this time of year here, and my mind went to soup while my heart was still all “but you don’t like soup”. But I remembered – my family does like soup especially when they are sick. And, yeah, I don’t like broth soups but I do love chowder and creamy soups and bisque and such. …But when you’re sick, you don’t want a thick chowder – aghhh this is too hard. (sorry I’m playing out the whole inner convo again, which I actually love to do). The answer was to make a broth-based soup, but include a little roux in the beginning and a little cream at the end. The result changes everything. Use that leftover ham! I still had ham from Thanksgiving in my freezer, so I used that. Or just make ham. Regardless, make this soup. 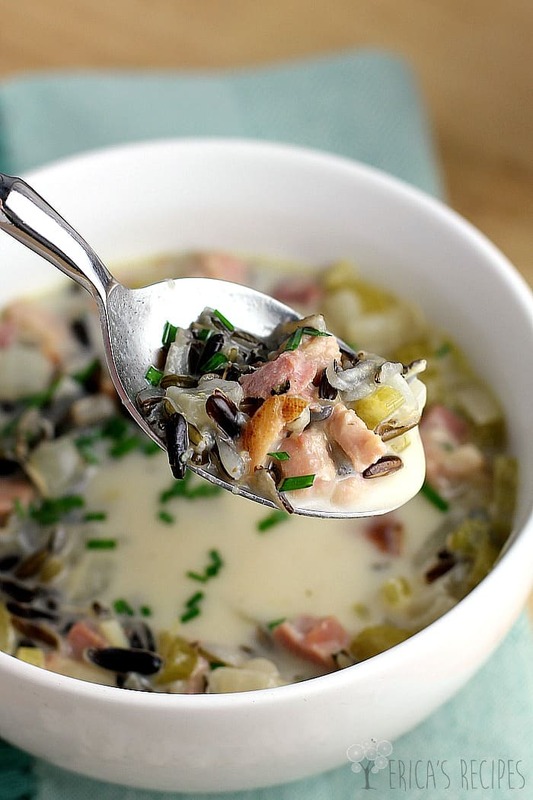 The salty ham, a couple veggies, and the nutty wild rice …this is just a surprisingly a good soup. The flavor blew my mind how good this was. Surprised. Changed for life. …Thank you soup. So this is it kids …a truly new and delicious bowl of love. Healthy for the soul. Warming for the heart. 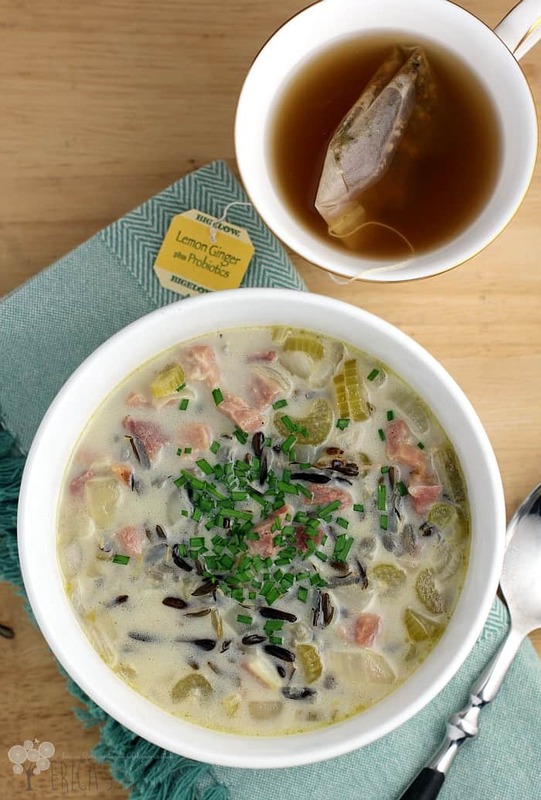 A creamy ham and wild rice soup with refreshing ginger and lemon. Heat the olive oil in a pot on high heat. Add the onion, celery, garlic, and a pinch each of salt and pepper. Saute the veggies until softened. Add the flour and cook, stirring, 1 minute. Add the chicken stock, scraping any browned bits from the bottom of the pot. Add the ginger, lemon zest, ham, and wild rice. Cover pot, reduce heat to low, and simmer 1 hour. Add the cream with another pinch of salt, and cook, uncovered, another 30 minutes to thicken just a bit and blend flavors. Taste for seasoning, and add more salt as necessary. Serve with chopped chives sprinkled on top. Oh heyy! What comforting dishes do you use to deal with the cold season? I’d love to hear from you, so leave me a comment and lemme know. That soup looks amazing and I love how you paired it with that tea. I love the combination of lemongrass and ginger. It’s a tough time of year for my family health-wise also. 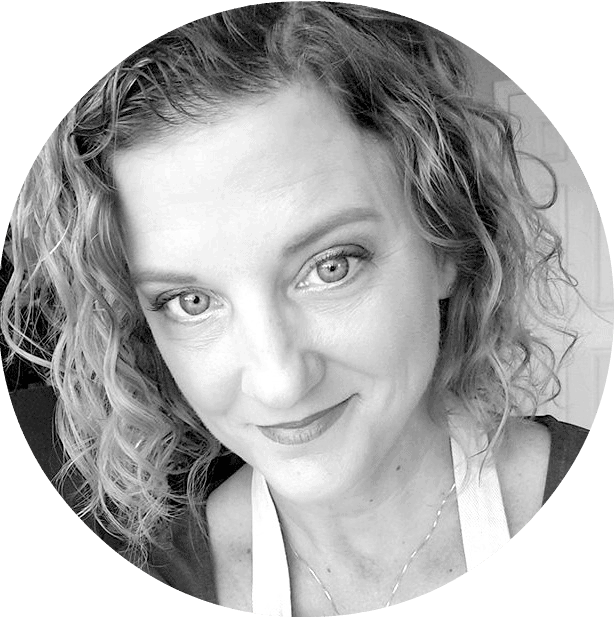 The kids are a mess, and now my husband is sick, too. Got to try this yummy soup & see if I can get everyone feeling like themselves again. 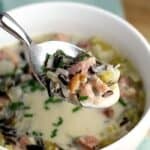 I’m such a sucker for wild rice soup! Love these flavors and that you also used ham! Perfect with the tea! That’s a bowl full of yummy right there! Soup is always good for what ails ya. Inspiration sometimes comes from unusual places. Bigalow Lemon Ginger tea-who would have thought a tea could generate a soup that sounds delicious! I love soup especially in cold weather (it’s raining buckets in CA). This is definitely comfort food for me. Love the wild rice you added. I bet that adds some tasty texture too! What a fabulous idea. I never thought to add a tea bag to soup for flavor, but it is an awesome idea. Would love a bowl of this deliciousness right now. Wow, this sounds and looks amazing! I’ve never tried the tea, your soup looks yummy. It would be perfect for winter. Perfect recipe and idea for this frigid weather that is headed our way; thanks so much for sharing! Well I LOVE soup so I’ll eat your share anytime. This looks outstanding! This sounds absolutely amazing! I want to try it! That soup sounds delicious! I love wild rice in soup. What a wonderful pairing…you are so creative Erica! Oh and yes, I hear ya about the hot winter we are having in Florida this year! This new soup sounds fantastic, Erica! I’m also in the ‘not a fan of soup’ category but my family likes it. You came up with a winner with this recipe. It’s so ‘warm me up and make me feel better’ I love this soup. Great recipe Erica, perfect for the season. This soup sounds so so delicious! The combination of flavors is absolutely gorgeous! It might not be soup weather where you are but it definitely is soup weather up here in Boston! Brrr. I’d like to cozy up w/ a bowl of this today! Oh this is so unique and I cannot wait to give this a try!! The lemon ginger tea sounds just wonderful! Adding it to my list! Love your inspiration for this soup! What a delicious way to feel better!